Our function plotTangentSpace() performs a Principal Components Analysis (PCA) of shape variation and plots two dimensions of tangent space for a set of Procrustes-aligned specimens and also returns the shape changes associated with the two plotted principal axes. We purposefully restricted the options for this function because plotting in R has almost endless possibilities. That is why we added the ‘verbose=TRUE‘ option, so that the pc scores and pc shapes could be plotted on their own. And users are of course expected to do this for their publications and reports. In this week’s exercise, we explore a few options to do advance of plotting PCAs and TPS grids with geomorph and R base functions. 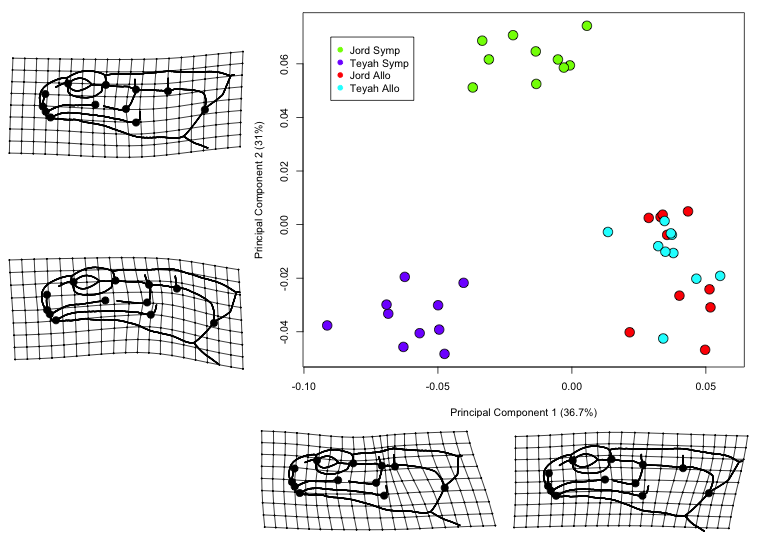 Exercise 7 – Plotting Principal Components Analysis Graphs with TPS grids. You can also assign the names by hand using HEX codes or names of colours. Finally we add the TPS grids to demonstrate the shape changes along each axis. PCA contains the shape matrices PCA$pc.shapes.